Wednesday, May 23 - Firenze! I think that every breakfast that we have had since arriving in Europe has been really great! The selection and quality of the food has been top notch. I really can't think of anything that I didn't like. And there has been no shortage of food on this trip. We've had a number of authentic dinners at small family run restaurants in the Netherlands, Germany, Austria, and now in Italy. The food is so good, and much of it is different from what we have in the USA. Below is a picture of a part of Janice's breakfast on Wednesday morning in Florence. You can tell that it's Janice's as I would not have any kind of coffee and my pastry would have fruit or something besides chocolate on it. At our hotel in Florence, we ate our breakfast in an outside courtyard garden. In addition to something that smelled a lot like honeysuckle (though it was slightly different in the appearance of the flowers), there were orange trees in the garden. There were signs which said that the fruit was not good for eating, but they sure were pretty trees. In the nearby square was an obelisk seemingly supported on it's four corners by turtles. 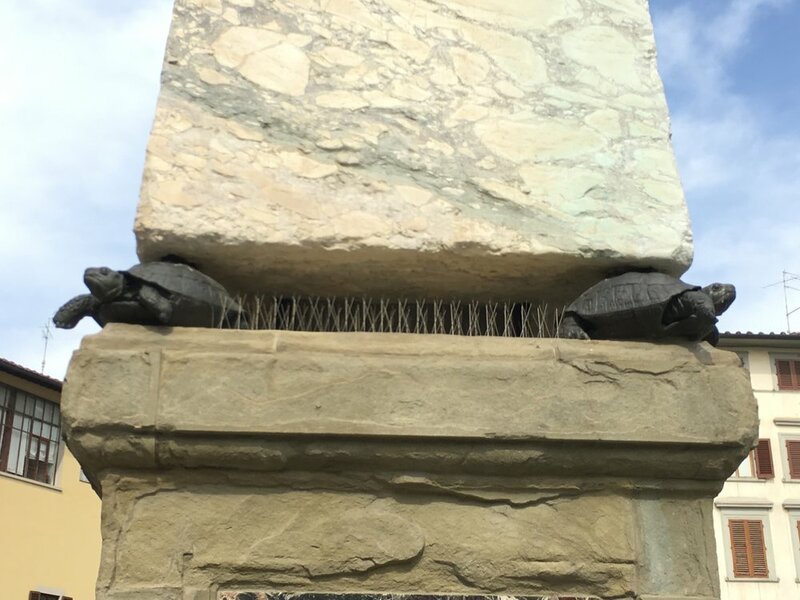 We didn't pause long enough to get the story of these turtles or the obelisk on their back, but the site made us think of our friend Alicha in Virginia! We spent part of our morning looking around an open-air vendor market near one of the large churches. The smell of leather seemed to be everywhere, and it was a pleasant smell. There were vendors selling all sorts of things here - scarves, selling., T-shirts, belts, statues and souvenirs, purses, and all sorts of other things. It was fun walking through and looking at what these people were selling. 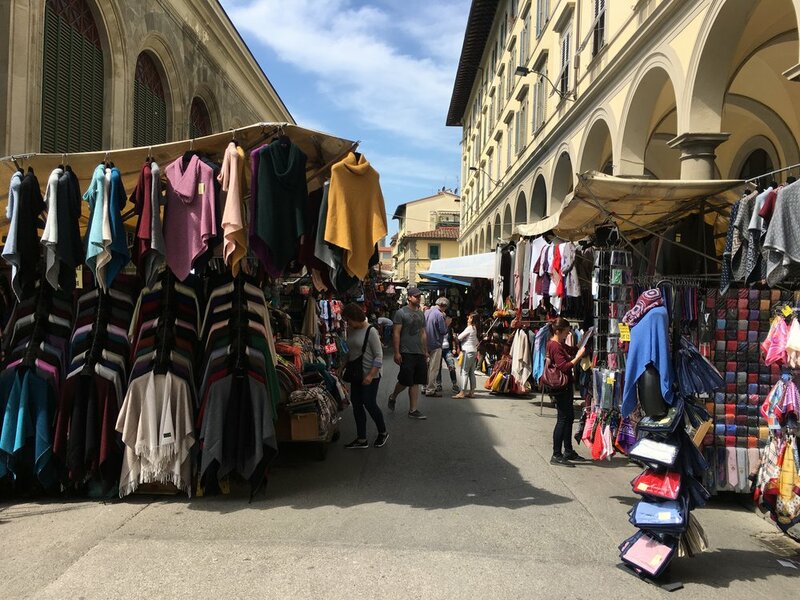 It is possible that we might have come out of this market with a few less Euros in our pockets and a few nice things in our bag! You really do not have to look very far to find a place selling gelato in Italy. We treated ourselves to a couple of small cups at the shop below after a good long walk. This time we tried the Mango, Banana, and Vanilla Cream. All were excellent! In the late afternoon (after 3PM) we were going to have a tour through the Uffizi Gallery. We were done with our morning free time, so we took a walk with Kim away from our hotel and across the river to see a few sites over there before going to meet the others from our group at the Museum. We stopped briefly to snap a few photos at this bridge over the Arno River which runs through Florence. This bridge is the Ponte Alla Carraia. 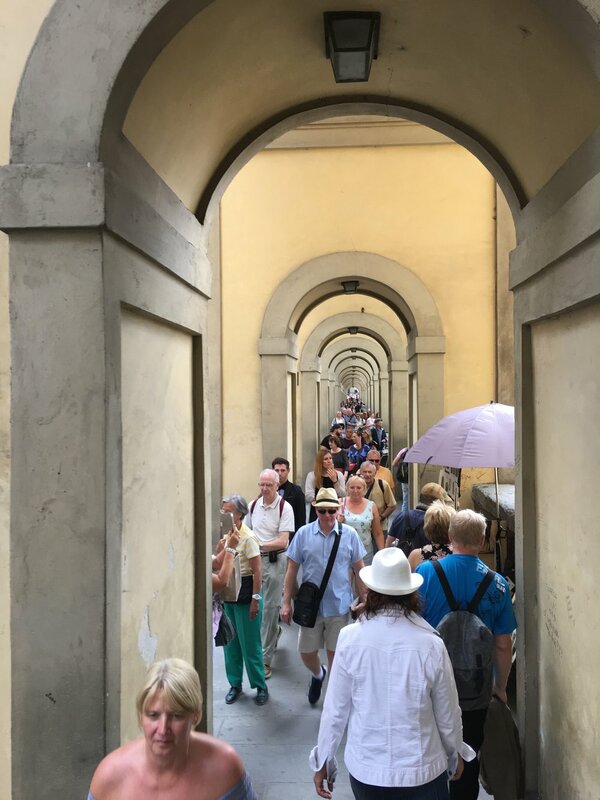 The image below shows the pedestrian walkway to the back of the Uffizi Gallery from the Ponte Vecchio Bridge. The bridge is now full of goldsmiths and jewelers as the butchers were all kicked out of the stores on the bridge centuries ago! There were so many people here, and cars and scooters rushing by on the street just to the left of the walkway. Looking back at the Ponte Vecchio Bridge from the pedestrian walkway. In the courtyard between the two wings of the Uffizi, there are large marble statues of many of the great artists of the time. 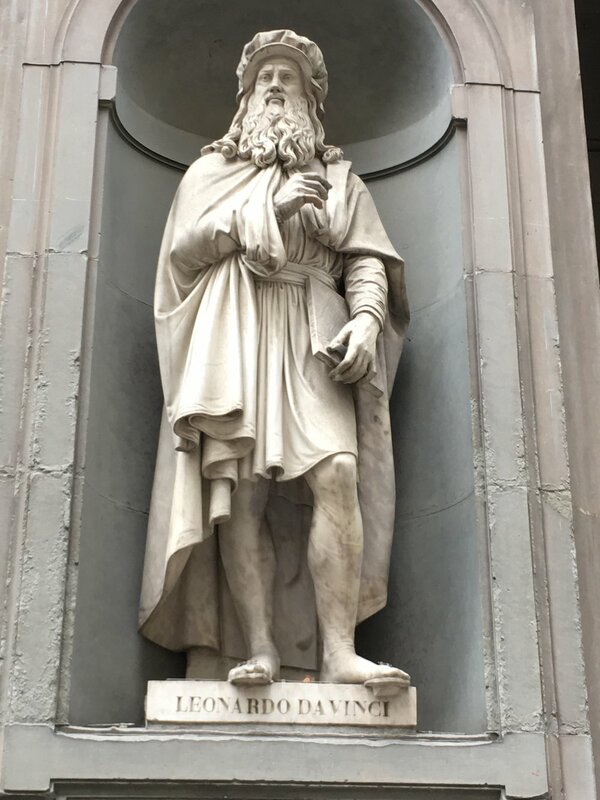 Below is a statue of Leonardo di Vinci. Nearby was a person (a mime I suppose) dressed up like Leonardo, all in greyish white clothes with a white face. He looked almost like a statue and stood very still most of the time. Occasionally he would very slowly move around and have his picture made with some tourists. We saw so many treasures in the Uffizi. 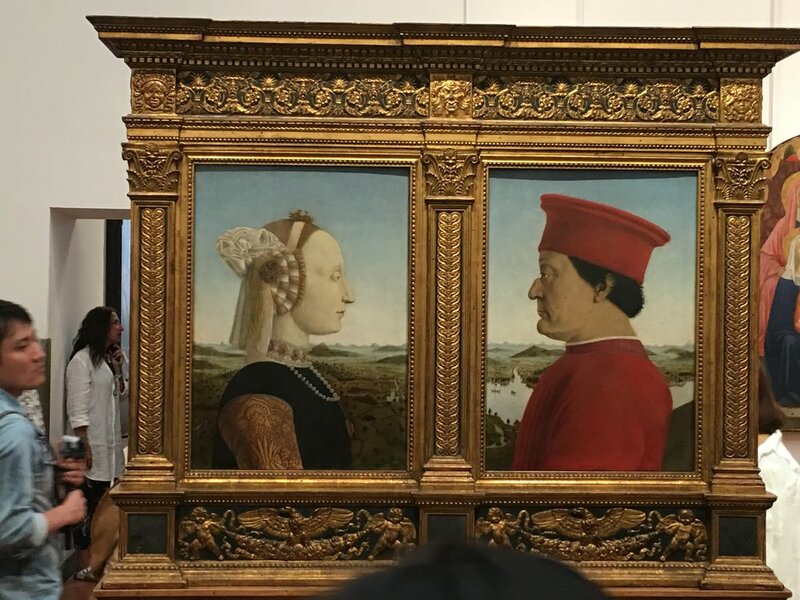 Below is one of a gentleman and his wife - The Duke and Duchess of Urbino painted by Piero della Francesca in 1465. Our guide Cindy told us that the reason they were painted in this unusual way for the time (as profiles rather than front views) was because the couple commissioned the work to be done this way to hide the serious injuries that the Duke had on the right side of his face. He had been severely injured, his eye was gone, part of the top of his nose was gone, but a painting done in this way did not reveal these things to the viewer. 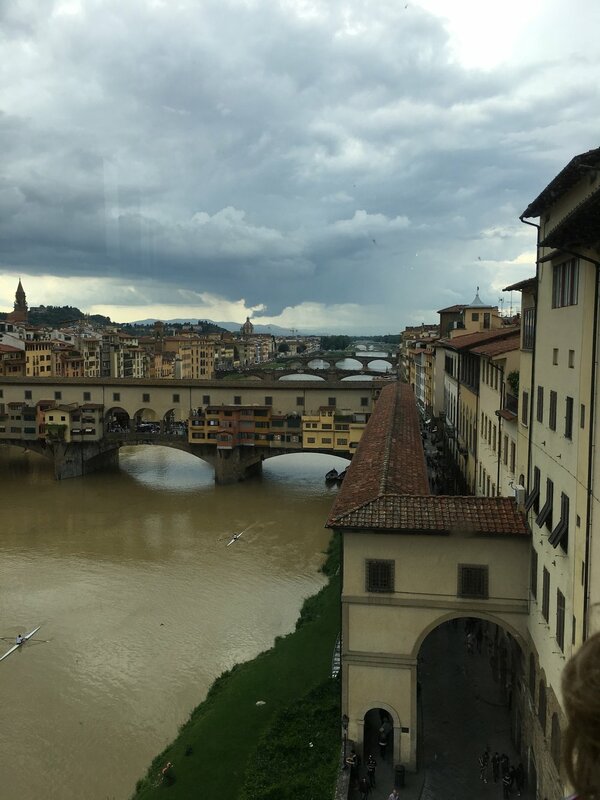 Below is a view out of the windows upstairs in the Uffizi, looking back on the bridges downstream. 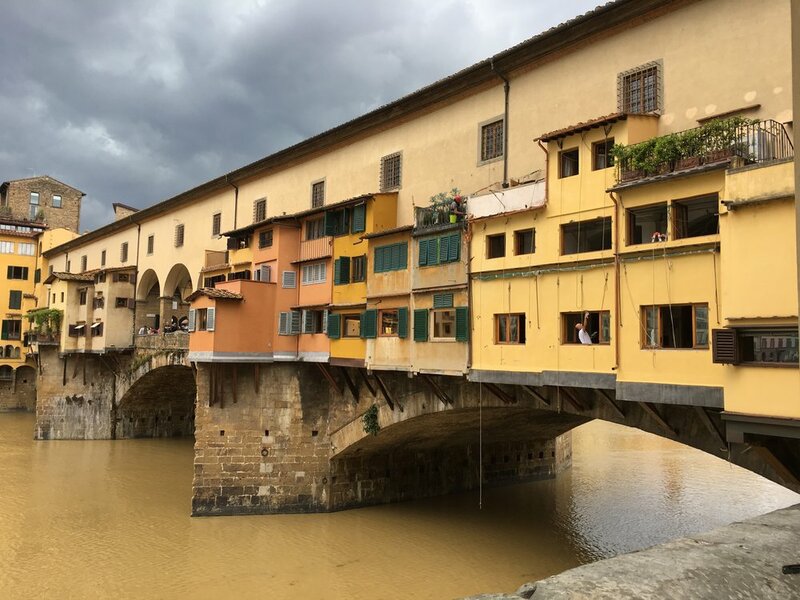 The first bridge is the Ponte Vecchio. The next is the Ponte Santa Trinita, and then the Ponte Alla Carraia which we had crossed some hours before. Below is a view of one side of the Palazzo Vecchio from the Uffizi. 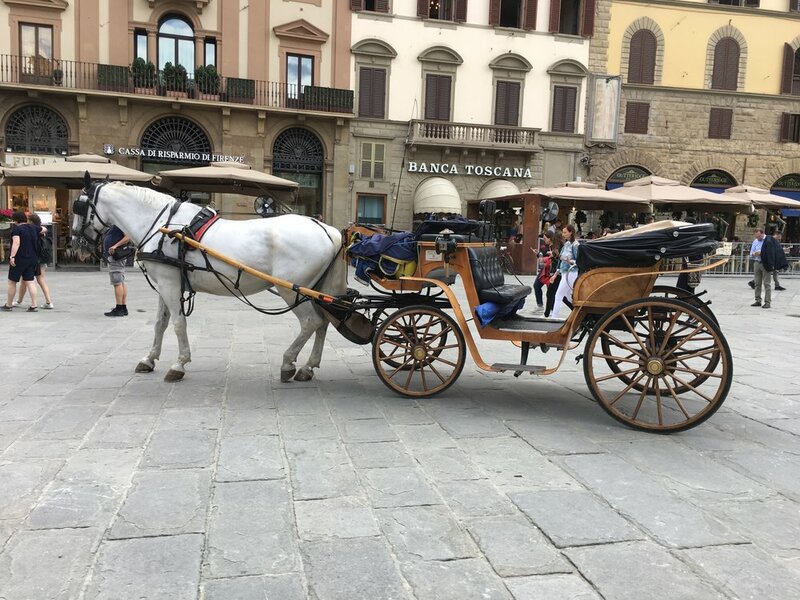 On our way back to the hotel - we saw a couple of horses and buggies in the square near our hotel. We had a full day, had walked only 6.3 miles this day but it sure felt like more than that. We would leave Florence the next morning for Rome. Time to get some sleep. Thursday, May 24 - All roads lead to Roma (and some to the Vatican)! !